Easy corn chowder is a wonderful soup. I love that you can put it together in less that 30 minutes. 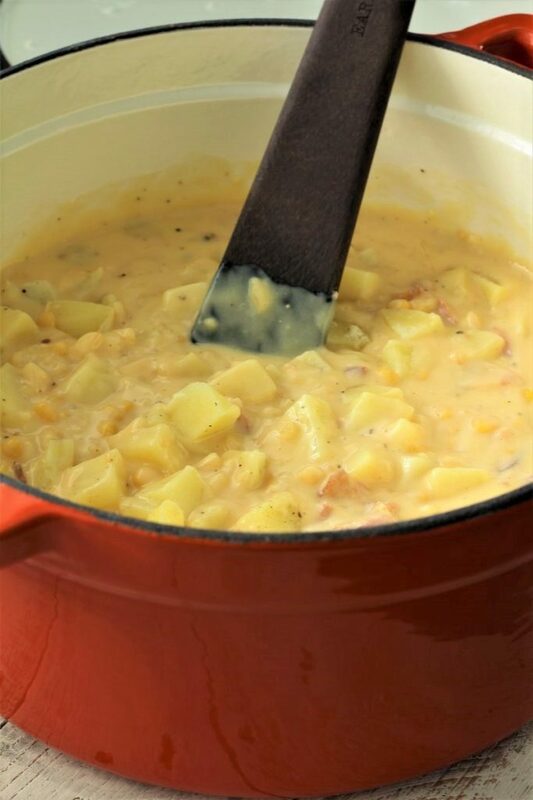 And since we have snow in the mountains and the weather has turned cold, easy corn chowder is a welcome sight at our house. 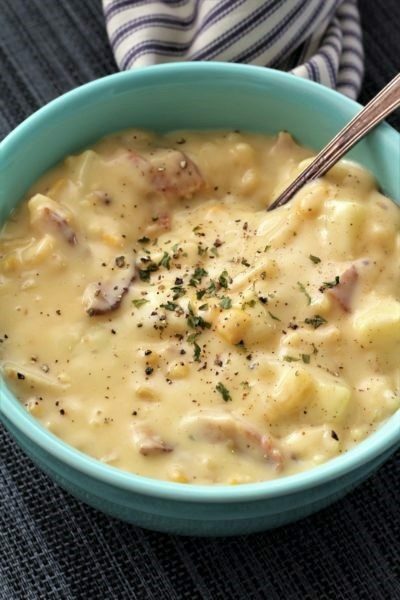 The bacon really adds to the easy corn chowder. And I know that there are a few of my family members who LOVE bacon. So if you are looking for a last minute idea for dinner, look no further. Four simple ingredients all come together to make one amazing soup. Well, it is that time of year again, when we get around 100, 50 pound bags of potatoes. Since I have so many potatoes around here, I feel like it is time to use some of them up. Now I don’t use all of them myself, we get a shipment from Idaho, and then we sell them to our friends and neighbors. We use to sell them when the kids were young as a fundraiser for scout camps. Every year my husband asks me if we should get potatoes and every year I tell him no. Then someone will come up to him and say when you get your order of potatoes this year, be sure and add me to the list! Then he feels all obligated and here we are trying to get the potatoes out of the garage so that we can park in there again. That’s okay, it is always good to be neighborly. I can truly say that I haven’t lifted any bags this year because of my back. However, my husband looks like I did 4 weeks ago; I don’t think it is because we are getting older or any thing like that? All I know is that I told my husband with this cold spell that I was moving to Arizona and he told me that he would come and visit me! How rude! I guess it is a little hot down there in the summer, but I am not looking forward to shoveling snow this winter. I do love the snow on Christmas Eve, and that will be here before we know it . Do any of you have any great ideas for Christmas this year? Now that my kids are older, I was trying to think of something fun to do other than gifts? My oldest son told me let’s go to Mexico, but I was thinking of something just a LOT cheaper? One year we stayed at a resort with all the kids and it was a wonderful vacation. It was when we had one grandchild and no in-laws at the time. We truly had a wonderful time and it was an all inclusive. It was cheaper than taking our family to Disneyland. The son that suggested Mexico, is not big on swimming and so I was surprised, but they had a lot of fun activities to do other than swim. They had all kinds of fun activities. And a family show every night. I loved that they based it around families. If you ask me what I loved most about it, I would say just being with family. And maybe even not having to cook. Ha ha. Don’t get me wrong, sometimes it is just nice not to have to think of what you are going to have for breakfast, lunch and dinner. You just go look and pick whatever you want. So, I must say that I would love to go again, and my grandson that is now 9 years old has always wanted to go back. The problem is, how do you take just one grandchild when you are soon going to have six grandchildren? Sounds like the kids better start saving their pennies, and I will too. I think that easy corn chowder is so good that they could have it on their buffet. Please let me know what you think of it? 1- I like to put my bacon on a cookie sheet or baking pan and place it in the oven for 30 minutes on 350 degrees, or as long as you like to make it as crunchy as you like. 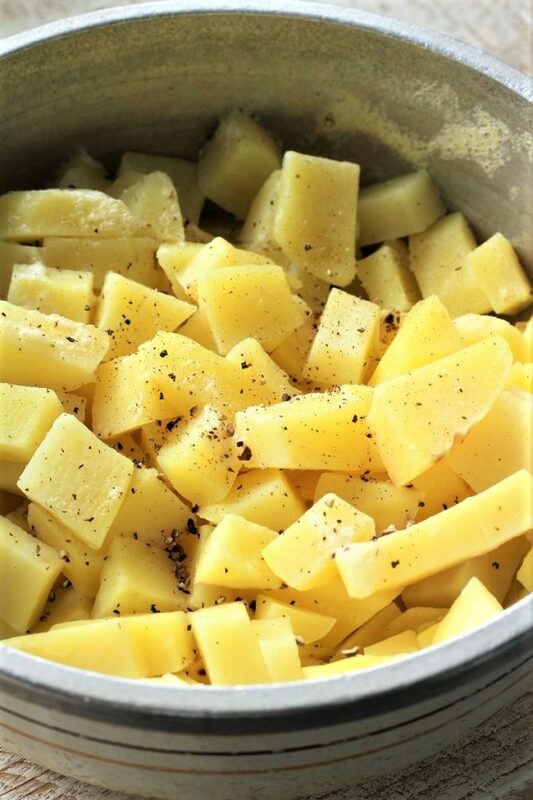 2- You can use whatever kind of potatoes that you like, but I like to use Yukon gold, as they stay a little firmer when cooked. 3- If you like your soup a little thinner, you can add the juice from the corn a little at a time to make it the consistency that you like. 4- Serve with our Fluffy Cornbread. In a large pot, place the water, soup mix, bacon, and corn. Looks so good!! Thanks so much for stopping by!! Thank you. I really love your trees. Thanks for leaving a comment. 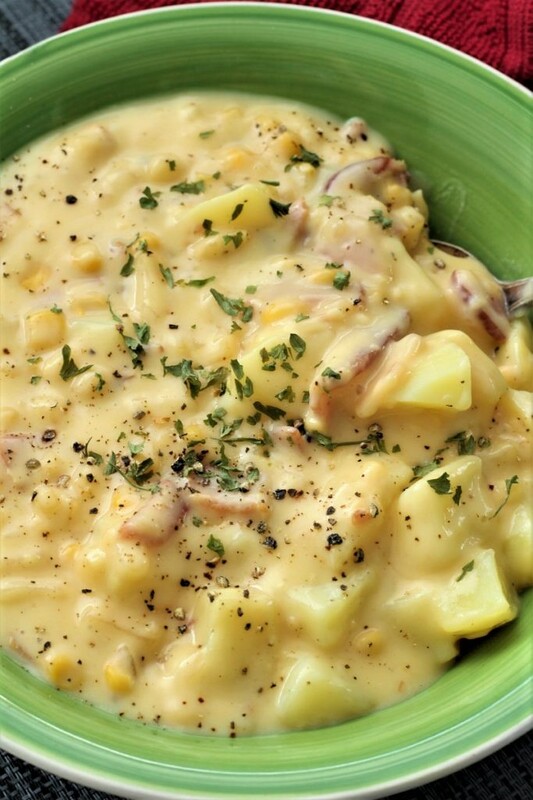 Mmmmm – potatoes and corn – two of my favorite comfort foods. This sounds delicious, especially on a cold day. Thank you for coming by and for leaving a comment. This soup is wonderful and I could use some right now. It froze here last night. What a great way to get a delicious dinner on the table in no time! This looks delicious! Yes it is – so quick but so delicious! Thank you for your comment. This looks so delicious! Pinned. Thank you. It really is delicious. We appreciate you coming by.